Matsuoka, Yuko - VM - George W. Gish, Jr.
by George W. Gish, Jr. In the hours and days following the death of Jesus on the Cross, the followers of Jesus were filled with confusion and disillusionment. The disciples had gone into hiding behind locked doors, cowering in fear. The account of the first Easter morning at the end of Mark’s Gospel tells us that it was three women who had followed Jesus and ministered to him from the early days in Galilee, Mary Magdalene, and Mary the mother of James, along with Salome, who had the courage to bring spices to anoint him in the tomb that morning as soon as the sun had risen. But they were ‘amazed’ to find a young man dressed in a white robe and sitting on the right side of the tomb. When he instructed them to tell the disciples that Jesus would be going before them to Galilee where they would again see him, the women ‘went out and fled from the tomb, for trembling and astonishment had come over them; and they said nothing to any one, for they were afraid.’ However, the final chapter of Luke records that when the women finally reported all this to the apostles, ‘these words seemed to them an idle tale, and they did not believe them.’ The scene then shifts to that moving passage when two of the lesser known followers of Jesus depart that very day for the village of Emmaus about 12 kilometers away from Jerusalem, which they would reach by dusk. We are told that one of them was named Cleopas, but that is all we know of them. In describing her work Yuko Matsuoka explains that since she had been painting the sky or heavenly universe for years with dramatic colourful clouds and stars as the place where God reigns, she wanted to depict this special evening time at dusk as the scene for the first appearance of Christ to his two disciples. We notice that the sky in On the Way to Emmaus covers more than half of the canvas. Although it is dusk, Matsuoka hints at the dramatic sight of a new dawn with rays coming down from heaven, while one disciple is pointing to Emmaus in the distance. For Matsuoka the bright orange around the disciples reflects their burning hearts, while the pinkish hue expresses the warm atmosphere surrounding the three persons. 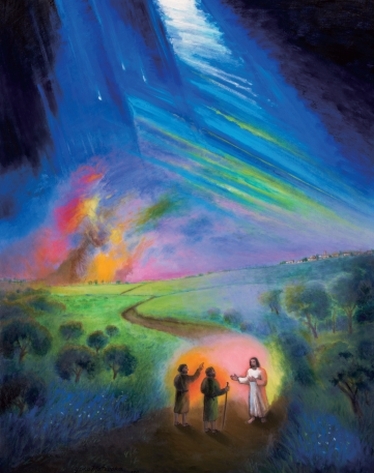 Both colours are repeated in the glow of the evening sky, which vibrates against the deep blue light bursting down from above, as a precursor of the days ahead when the Risen Christ will always be with us along our own humble journeys. Matsuoka explains that there are no scars on Jesus’ hands, for at this moment the disciples do not yet notice that the person is Jesus. All of the figures are small in comparison with the overall landscape, which is a common practice in traditional Japanese landscape paintings. This leaves us with the striking effect of light breaking out from above like a spectacular display of Aurora Borealis or polar lights, with the human figures seen in a humble perspective in relation to the magnificence of God’s creation. As we can see in On the Way to Emmaus the works of Ms. Matsuoka make use of deep translucent colours that vibrate with heaven-like tones, filling the viewers with hope and a spirit of calm that reflect her own Christian faith. In spite of many misfortunes and hardships since her early childhood, Matsuoka has been able to inspire and uplift others with works that depict God’s transcendent love that is always present to us. In spite of all the confusion, fear and uncertainty following the triple disasters of the massive earthquake, destructive tsunami and nuclear reactor meltdown that struck simultaneously one year ago in Japan, the encounter with the Risen Christ as depicted by Yuko Matsuoka can give us hope for renewal in the power of the Resurrection. Yuko Matsuoka: On the Way to Emmaus, 2011, oil, 116.7 x 91.0 cm. George W. Gish, Jr. is a long-time resident of Japan, having served as a United Methodist missionary for over 50 years in the fields of education, communications, community and church work. His involvement with the Japan Christian art world has extended over 40 years, along with continuing research and teaching in his specialties of ethno-musicology and cultural history which include widely acclaimed efforts to keep alive such endangered music forms as the classical biwa (lute) tradition of Japan. For the past three years, he has served as Vice Moderator of the National Christian Council in Japan.